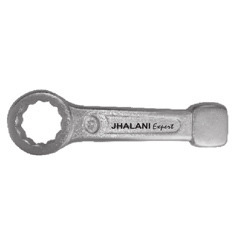 With main focus on optimum client satisfaction, we are offering Bihexagon Ring Sledge Spanners (JTI Forge). In order to make these products highly reliable for a longer service life, our vendors manufactured these spanners using optimum grade raw chrome vanadium steel. These products are suitable industrial applications and give long lasting flawless performance. We are offering these spanners within affordable price range with assurance of timely delivery direct at clients' end. Plated / Black Finish. Generally Conforming TO IS-4509-1992.